With autumn now in full swing many couples will be planning their luxury, winter wonderland themed wedding. And who says you can’t still have your special day outside?! 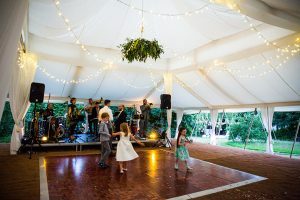 Yes, those long hot summer nights have come to an end, but that doesn’t mean your dreams of an outdoor wedding have to end too. Let’s face it, even in summer, the UK is not guaranteed non-stop warmth and sunshine – through this year we were particularly lucky! For those colder evenings, we can offer our temperature-controlled, wonderfully warm selection of beautiful tents. This, combined with all the dancing and the wonderful wedding extras which we also supply, will keep you nice and toasty as the evening progresses. Full wooden flooring, sealable doors and a solid structure also allow for extra warmth. 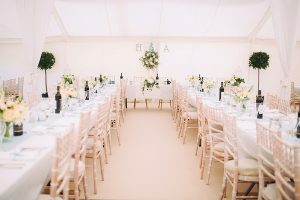 Whether you are hosting a party for a selection of close family and friends, or you are looking to invite a huge number of guests to your winter wedding, we have luxury marquees that cater for any winter wedding. For example, our India package hosts up to 120 guests while the Savannah package hosts up to 192 guests – with room for a separate dance tent and dining area. Alternatively, we can personalise our packages to your individual needs – get in touch with our friendly, experienced team for more information. Of course, the decoration is entirely up to you! 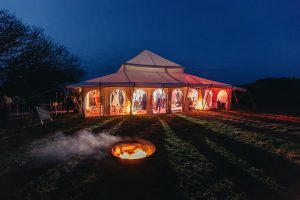 But we can help make suggestions on how to personalise your luxury wedding marquee, with design and preparation suggestions to make each and every item stand out. Whether you are after twinkling lights, stars, white tables and chairs, or anything you think will encapsulate this wonderful winter theme, we can work with you to make sure your day is truly magical. A range of luxury materials are used to create our marquees, as well as the structure and flooring. From rustic coir coconut flooring and elegant carpets, to sumptuous ivory/cream cotton drapes and linings, we can provide everything you need to create your perfect winter wonderland. In addition, we have many lighting options to ensure the atmosphere reflects the theme of your wedding. Get in touch to find out more about these options. As well as providing exceptional marquees for your winter wedding, we can also provide other party requirements including generators and toilets, etc. We work with a number of locally recommended suppliers so that we can take all the hassle out of your wedding planning so that you can focus on the important things. At The Beautiful Tent Company, we are here to ensure your marquee hire in Devon and the South West go above and beyond your expectations. Not only will we work closely with you to make your stunning winter wedding ideas come to life, but we will also even keep check on the weather so that any last-minute preparations can be made. Contact one of our team members today for more information on 07766 460886. Web Design & Marketing by Media Street.